James Packer is one step closer to kicking off development of the Crown Sydney high-rollers ­casino at Barangaroo, following a move by state planners to recommend the plans to the state’s highest body for approval. The NSW Department of Planning has recommended Crown’s plans to the Planning ­Assessment Commission — an independent planning authority representing the minister — for approval. The Planning Assessment Commission is the final hurdle the casino must pass through before receiving final approval, and development at the site can start. The move comes after Crown Resorts agreed to concessions at the development, including reducing the bulk of a podium facing a public walkway, and to provide public access to an observation deck on the 65th floor of the 71-level tower. “This recommendation was made after thorough assessments against clear and consistent rules,” a Department of Planning spokesman says. 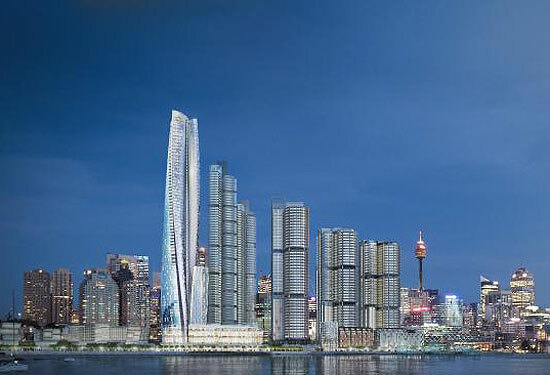 An artist’s impression of the Crown Sydney casino at Barangaroo, which has won approval from state planners. Crown addressed a number of the department’s planning concerns including improving the connections and views for the public at the new Hickson Park, Central Parklands and the foreshore. Other conditions attached to the proposal included limiting the size of the licensed area within the ground floor of the hotel to enable the public to circulate more easily, conducting a lighting study to assess the impacts of the project on the neighbouring Sydney Observatory, and limits on the operating hours of the outdoor and ground floor areas of the hotel. “These recommendations will achieve better outcomes for the community, including better-­designed open spaces allowing the public to access Sydney Harbour and enjoy Barangaroo South,” the planners add. The Planning Assessment Commission will now call for a public meeting to review the proposal, which is expected to happen towards the end of April. Crown executives are eagerly awaiting a final decision. “Crown worked with our architects to ensure the Planning Department’s conditions are addressed. Our updated designs, including significant changes to the hotel podium, will help ensure Crown Sydney is embraced by the local community and visitors as one of the world’s best hotels and architectural icons,” a spokesman says.